In recent days (see here and here), thanks to Conky, I've been regaling myself with the wonders of CPU and GPU temperature variations and control. I've done this in a number of OSes (Linux and FreeBSD) and on a number of computers (two Desktops and a netbook) but, up to now, have not looked at what is my workhorse machine -- my MacBook 6.1 with Intel Core2Duo 2.26 GHz processor and nVidia GeForce 9400M GPU. Well, you have to fish around a bit but the unimaginatively named Temperature Monitor is available for free. This is an elaborately designed utility that can sit in the Mac dock and display any two of a wide range of temperatures within the Mac. 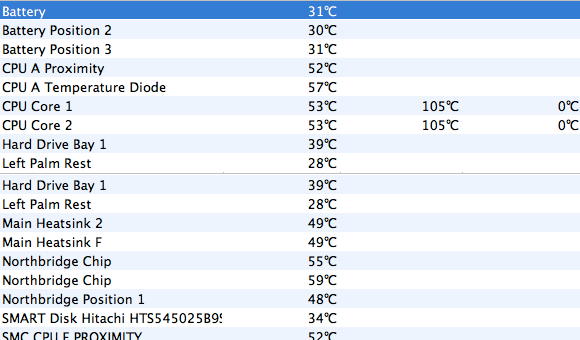 On my Mac the screenshot shows the temperatures available. I chose the two CPU core temperatures to show in the dock icon which gives me a permanent view of how these are going. Amazingly though, no GPU temperature is available although Release 4.0 (I'm using 4.94) of this utility introduced GPU temperature monitoring. Indeed, I've seen GPU temperatures listed on one of the screenshots for this utility. Could it be that the nVidia GeForce 9400M card in this box has no temperature sensor? Sounds a bit far-fetched but can't be ruled out. One thread I came across suggested using one or other of the three Northbridge temperatures included in the list of those measured by the monitor as the GPU is in this region. While this latter point is true (see here), I'm not at all sure how valid the recommendation is. All-in-all, this is a nice monitoring system which is easy to use and has an extensive configuration capability. Although I've only been using it for a few hours, it seems my CPU temperatures can vary from a low of about 43ºC to a high of 67ºC. Note that this latter was seen during what I would call pretty mundane CPU activity such as internet browsing -- nothing at all heavy. This means that my MacBook CPU temperature operates in a higher range than any of the three computers I had tested earlier. Another useful utility I came across is CoolBook Controller. This monitors and allows control of CPU frequency and its voltage. To date, I haven't tried any controlling, but CoolBook Controller clearly shows how assiduously the Intel processor varies its frequency as a function of activity.